There are all sorts of India v Pakistan previews out there, but this is currently the only one on this website that goes up to nine. Evidence, if it were needed, that the “hey, what’s that over there?” bowling ploy can work just as well at international level as it can in the back garden. We’ll literally never tire of it. This is why. Who’s been taking all the wickets and not going for runs? Hasan Ali, that’s who. No-one has scored more runs at a lower strike-rate in this Champions Trophy. Not too many people have scored fewer runs at a lower strike-rate either. Yet Pakistan are still in the final, so can anyone really quibble with his approach thus far? Misfield by team-mate – angry. Lack of effort by team-mate – very angry. Hugely pleasing individual or team performance – positively enraged. Never mind measuring bat speed or the distance covered by fielders, what we’d really like to see is some sort of videogame-style graphical representation of Virat Kohli’s fury levels; a sort of gradually filling bar that turns red and glows once it’s completely full. He’s only been out once in the entire tournament. For a duck. This is quite simply what cricket’s all about. Please give him a bowl in the final. Please. Apparently Jadhav doesn’t practise his bowling much in the nets. You’d never guess. Most teams are keen to groom players for major tournaments in the hope of maximising what they get out of them when it matters. Pakistan pick debutants and see what happens. Zaman has so far made 138 runs in his 117-ball one-day international career. Whether it’s a feeble batting collapse, a crazy four-over whirlwind of wicket-taking that decides the match, or Mohammad Hafeez suddenly deciding he’ll bat like Shahid Afridi, you’ll know the moment when Pakistan start pakistanning and it will be (in)glorious. You had fun writing this, didn’t you? I know I had fun reading it. Positively enraged. Jasprit Bumrah fact: He has played the most international matches without scoring an international run. He heads the list by miles. Relevant fact – Despite Briggs holding the England record for scorelessness, he has just decided to become a batsman and hit 120 not out against South Africa A, more than double his previous high score in first class cricket. It would have been even more brilliant if the list had gone up to eleven. Where’s your sense of authenticity in your parody/pastiche quotes? That’s a mystery that’s best left… unsolved. 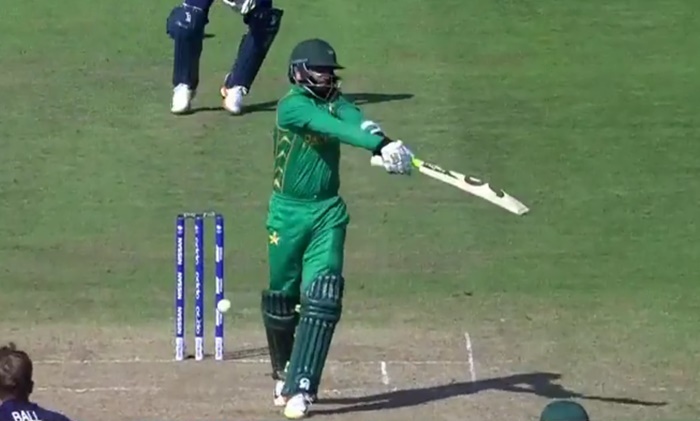 Azhar Ali seems to have manufactured his shot so his shadow is seen to execute a perfect golf swing. He may have a low strike rate, but have you seen his putting lately? I haven’t worked any of the rules out yet, but as a basic concept I think there must be something in “shadow cricket”. 22.6 Ashwin to Azhar Ali, OUT, he’s gone! His partner was ball watching and he has to pay for it! Azhar’s one! India have their breakthrough. The Oval erupts. Oh, this is poor from Pakistan. There’s always a single there, and Azhar had made sure of it, placing the clip to the left of square leg. And it’s India’s weak fielder there too – Bumrah. He basically trips over himself and falls on top of the ball. Then has the good sense to pick the right end – the keeper’s – and Azhar has to walk off, muttering to himself. 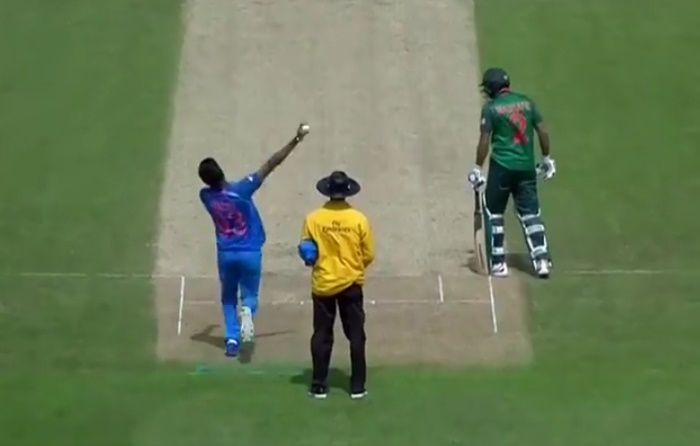 So we get virtually-a-debutant Fakhar Zamana causing a trademark Pakistan comical run-out (in the midst of all the batting chaos he is inflicting on India) on his slower-batting partner Azhar Ali, replete with stereotypically stumbling (though successful) Indian fielding delivered by Bumrah himself. Shame it was Ashwin bowling rather than Kedar Jadhav, and I wonder how angry Virat got, but other than that your royal synopsis was practically a ball-by-ball play (for one ball). 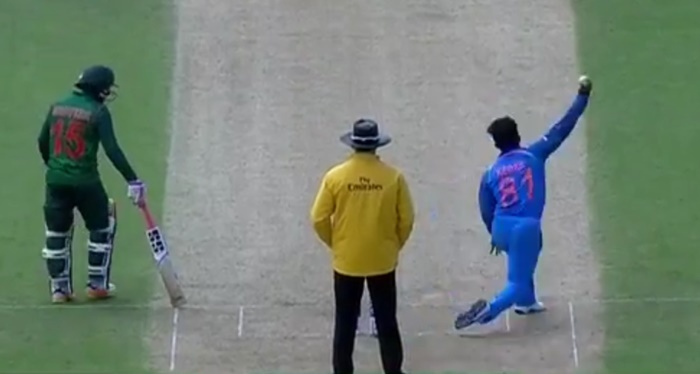 If anybody has a freeze-frame showing Virat’s facial expression just at the moment Bumrah slipped, I would love to see it. Have to apologise to all the Fakhar fans – he fell to the very first delivery after I started watching. Triple-bluff from the Pakis! What a performance.. Cricket will be better for this. Well all 9 of your points came to pass. Top punditry all round. To be fair I’m not sure we want the pundits adding “Jasprit Bumrah’s name will be Jasprit Bumrah” to their predictions list in the hope of increasing their prophetic percentages, but I’d give his majesty 9/9 on this one. Bumrah had both a great name and wacky bowling action for the entire length of the match, and KC was the only one to have the guts to predict this. To be fair to us, we did only have this down as “things to watch out for”. I imagine all neutrals are happy with the result. It’s been a funny sort of tournament, but one of the main things I’ve taken away is that there aren’t any ODI sides that are ‘a level above’ at the moment, almost all the teams involved have shown themselves capable of beating and/or being beaten by any of the others. Except Australia, they were rubbish.